Running a business dealing with the law connected with it can be confusing and time-consuming. 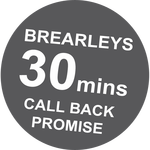 At Brearleys we ensure that we make things as clear and straightforward as possible for our clients which range from small sole trader businesses to large companies. Our pricing is clearly explained and all matters are dealt with in a cost-effective and swift manner, leaving you to get on with the important things such as running your business.